This is a painting called The Triumph of Death. Pieter Bruegel the Elder painted it in 1562. It attempts to show the death and horror of the time of the Black Death, some 200 years earlier. The Black Death was the worst pandemic in recorded history, taking place between 1348 and 1350. It originated in Asia and spread to Europe, killing between 30% and 60% of the population. The population of the world dropped from 450 million to 350 million. The "Little Ice Age" was happening at the same time. The combination of famine and disease made Europe a very unpleasant and desperate place to live. The population took 150 years to recover and the event had a profound effect on the course of human history. The Triumph of Death is oil on canvas. An army of skeletons is rampaging throughout a black and broken landscape. Smoke from burning bodies is rising in the distance. People from every social class are fleeing, fighting, and being slaughtered indiscriminately. There is a solitary cross near the middle which is having no positive effect on the mayhem. My first impression of the cross is that it is insignificant. Other paintings would have the cross prominently displayed, radiating glory, etc, etc. 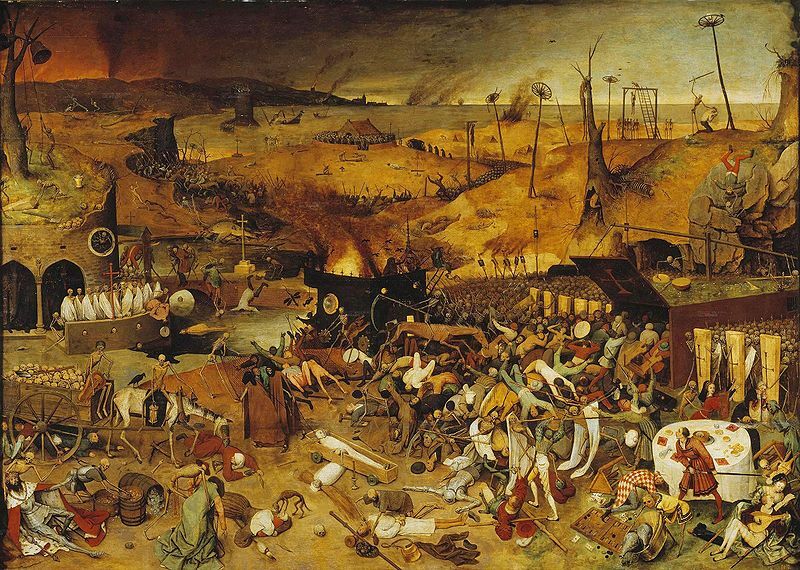 In this painting it's trying to do that but failing in the face of the pure evil of the plague. In the present day this has a powerful effect - it must have only been compounded in the 1500s when the church had more power. Although the insignificance of the cross is a good point, there are actually a lot more than one. In fact, they're almost everywhere in this painting. 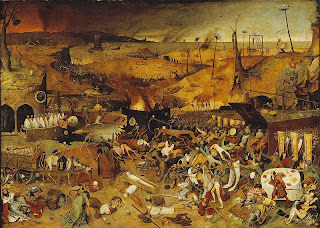 Using this larger image (http://mikemonaco.files.wordpress.com/2010/04/bruegel-triumph-of-death-supersize.jpg), I see a red cross held aloft by white-robed skeletons near the building on the left, and I also see a golden cross to the right of that one. There's also two more that are difficult to see in the small image, one above the black rooftop near the red cross, and another small one in the distance seen underneath the lighthouse near the horizon. There's also the cross imagery on the shields held by the skeleton army on the right, and the cross painted on the trapdoor of the box that the humans are being herded into. Finally, there are little tiny crosses adorning the top of the flaming stagecoach. I think it's relevant that of the seven different locations where a cross is visible, four of them are being used by skeletons, and the rest are essentially ignored, which in this painting means surrounded by skeletons maiming people. When the majority of the holy symbols aren't just captured, but were actually brought to the battle by the skeletons, the meaning of the cross isn't necessarily a straight reading (i.e. meant to be a direct representation of the church.) In fact, they seem to be symbols directly representing the death figures more than defiance of death (this is tricky since a cross can represent both of those concepts simultaneously). In any case the idea that the crosses are meant to, in some way, stop the death figures is clearly being violated here. Also, I like the two people in the bottom right who are dealing with the whole situation by playing a lute and making out. And is there a skeleton playing along with them behind the woman? It's hard to see.